Hi everyone, sorry for the lack of updates over the last couple months. Lots of stuff has been keeping me away from the drawing board. I really miss blogging and all my online friends, so I’m going to make an effort to at least post some short (and hopefully consistent) updates to let everyone know what I’m up too. 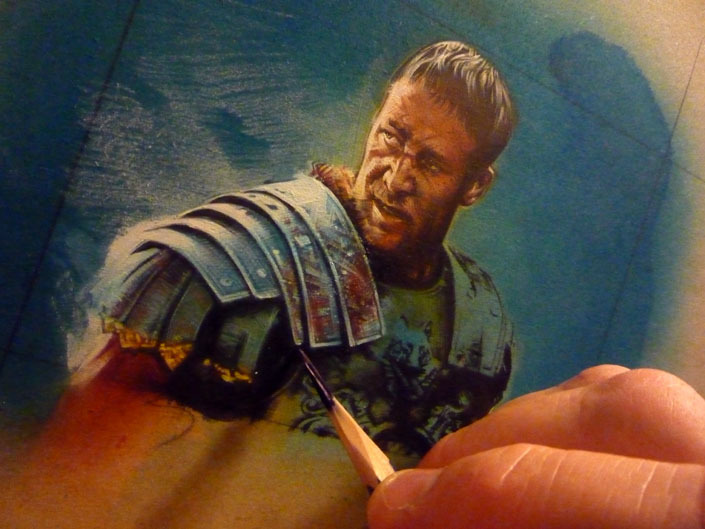 This is the first one, I’m about 75% done with this Russel Crow piece from the movie Gladiator. Thanks for sticking with me everyone, and also thanks for all the great comments, I love reading them. Hey man, last I remember, you were working a 9-5, being a husband, and a dad, I think it's safe to say not everyone has the stamina to do all of that, AND keep the art going all the time. I know I couldn't do it. I've tried the 9-5 and a part time while trying to get art done and I couldn't do it. No amount of drive got it done, so I know where you're coming from. That's an awesome piece too Jeff. Keep plugging away, man! The people that matter will remain by yer side dude. ~Challenger2008 ... Thats probably what I'll go down in history for, the guy with the sharpest pencils :)Thanks for the comment man! ~JonRiggle ... Thanks Jon, your comment means a lot! Great work, Jeff! It jumps right off the page! Glad to see you're still churning out awesome stuff! JON ... Thanks Jon, your awesome man! Hey man, do you do these on weekends only? WOW! Mostly weekends, but lately I've been trying to be more consistent in the evenings ... Its kind of working, just wish I had more time. respect to you Jeff :salute: keep it up!